I'm not sure who first said that the third year of law school is the easy one (I think the phrase I heard was 'lots of volleyball and beer . . .') but that person was a liar. There is still plenty of classwork (and a 30 page supervised research paper) to add to the mounting stress of finding a legal job in a dismal economic climate; I think America is about to be home to the most over-educated group of restaurant servers and retail salespeople ever. So, given my increasingly heavy -- but seemingly futile -- workload, I haven't had much time to do the things I love (like, er, blogging about crafts). One of the last enjoyable activities in my life I have tried desperately to cling to, though, is a weekly trip to the Soulard Farmer's Market in St. Louis. I love the market. I love being able to talk to a farmer about the diet and living conditions of the hens that lay my eggs. Or what a hard season it has been for my favorite honeycrisp apples. Or how happy the goats are in the herd that produces the milk for those creamy, tangy farmstead cheeses. One thing I am not crazy about, however, is the amount of plastic and paper I end up bringing home. Although I have "green" shopping bags, much of the produce I buy needs to be weighed, so I always end up loading three pounds of new potatoes into a disposable plastic bag so they can be easily scaled and handled. I inevitably come home with several "green" bags full of five times as many "ungreen" bags. Sort of defeats the purpose. So I decided to make myself some reusable produce bags. I wanted the material I selected for the bags to be lightweight; I want to pay for produce, not packaging. 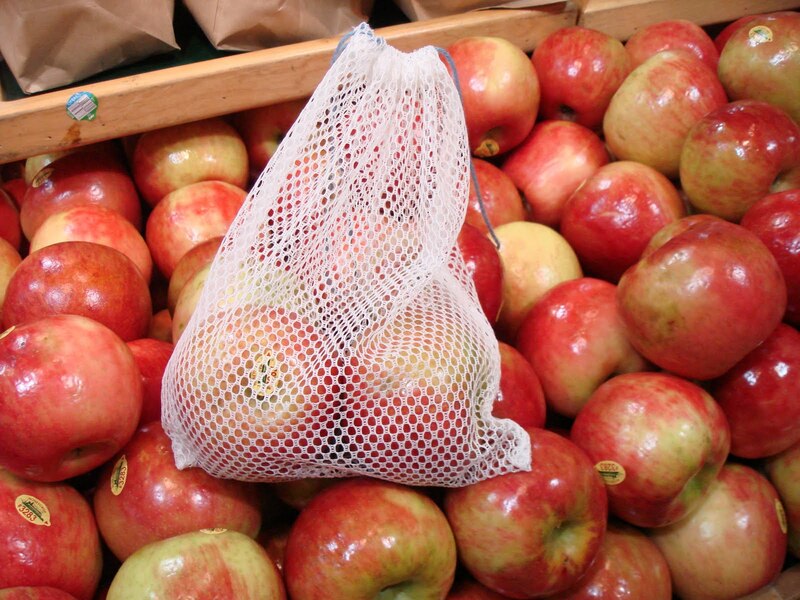 I thought it would be helpful if the bags were mesh, or somehow see-through to make it easier for the sellers. I also wanted them to be machine washable and sturdy enough to hold several pounds of produce without tearing. Initially I was looking for cotton mesh but it proved nearly impossible to find in my area. 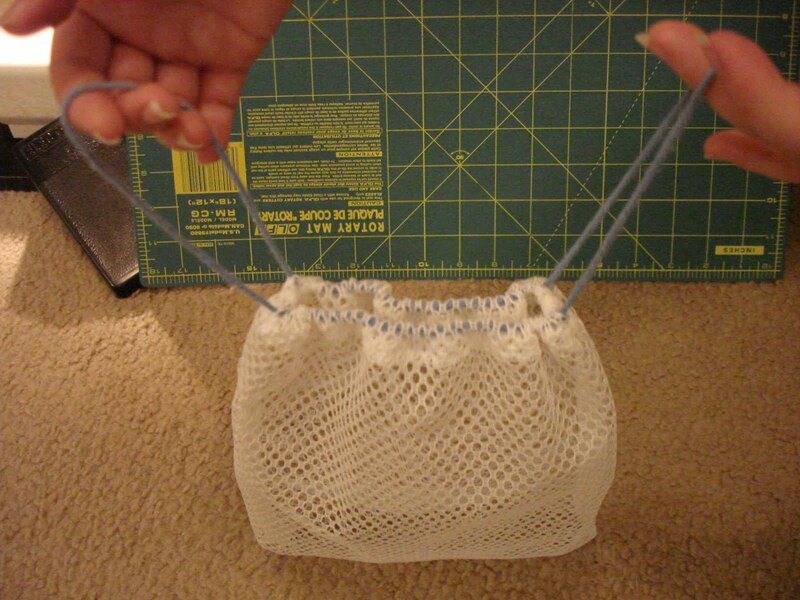 I settled on a white, polyester mesh for the bulk of the bags and some leftover cotton yarn for the drawstrings. 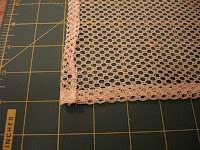 I started by cutting a rectangle out of the mesh along a fold. I opened the fabric up, creating a long rectangle with four raw edges. 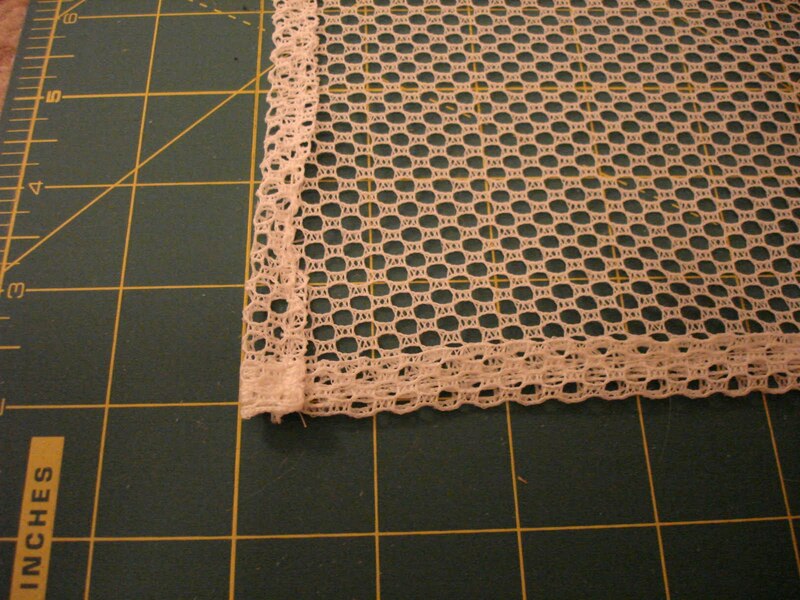 Because the cut mesh creates an uneven edge, I folded about 1/4" of each side over, then folded it again before sewing it, hiding the raw edge. I stitched the two longest edges, then repeated the process on the two shorter edges. 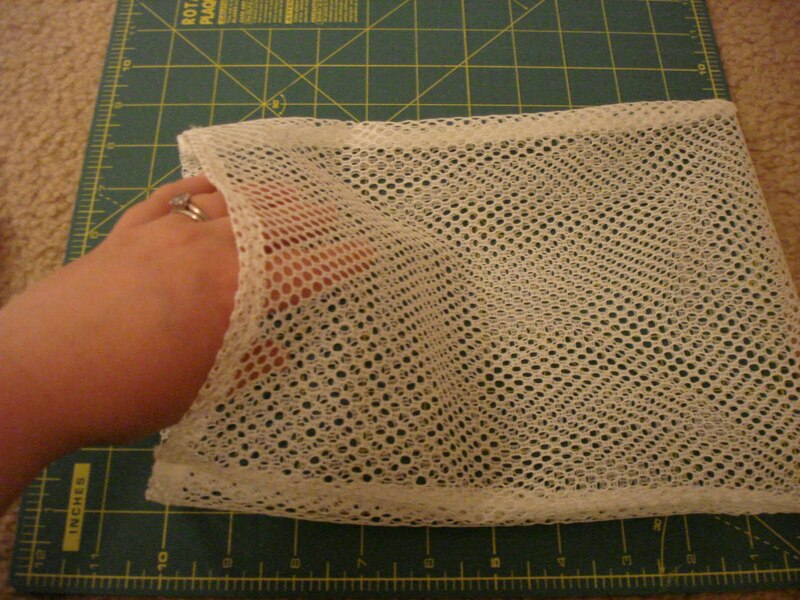 I was initially concerned with how my sewing machine would handle stitching through mesh, but it was not a problem. Next I refolded the rectangle along the original fold (in the center of the longest edges) and stitched along the two longer sides, leaving the edge opposite the fold unsewn -- like a pillowcase. Once the body of the bag was sewn, I flipped it rightside out, turning the seams inside. Now for the drawstrings. I cut two lengths of yarn, each a little longer than the circumfrence of the top of the bag. This part is a little confusing, sorry, but the pictures should help. Taking one length of string, I threaded one end through the mesh on one side of the seam, about 3/4" down from the top of the bag, I did the same with the second end of the yarn on the other side of the seam, bridging the seam with a length of thread and leaving the loose ends inside the bag. Then I tied the loose ends together securely with a knot. 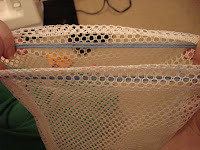 I repeated this process with the second length or yarn on the opposite seam of the bag. Essentially, this will leave only a short length of yarn visible on the outside of the bag at each seam and the rest of the yarn on the inside of the bag. 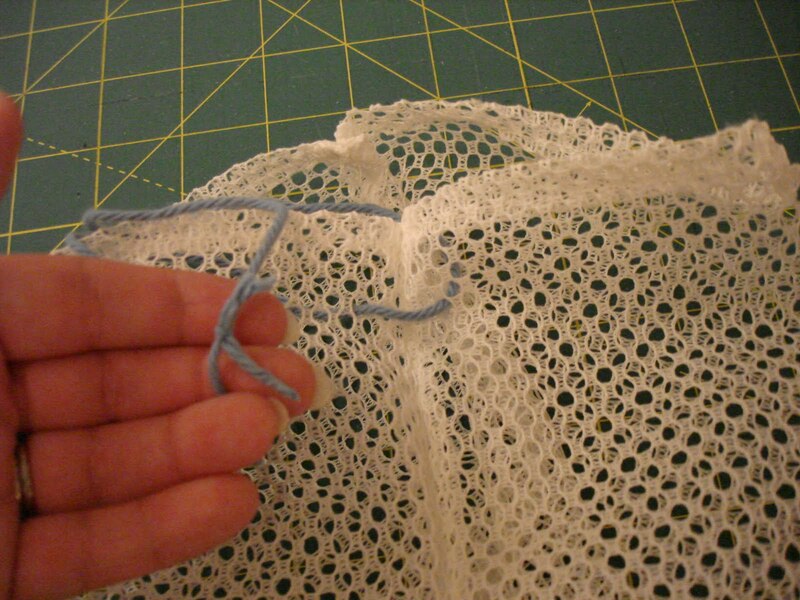 I straightened each loop of thread and held them along the inside of the top edge of the bag. Then I folded the top edge of the bag inward over the yarn, creating a pocket/tube to enclose the strings. I stitched along this edge, being careful not to stitch over the strings themselves, otherwise the drawstring would not pull closed. Once the strings were encased in their pocket, I pulled the small loops left on the exterior of the bag on each side; pulling the strings cinched the top of the bag inward -- my drawstrings worked! The bag I made was rather small; it will hold about five large apples. I plan to make bags in a variety of shapes and sizes (longer, narrower bags for carrots, celery, and green onions). I think these lightweight, washable bags would also be ideal for collecting wild mushrooms (morels!) because the mesh would allow the spores to filter out and fall back to the ground. They would probably make good laundry bags for hosiery, too. If you are tired of the amount of disposable rubbish that accompanies a trip to the grocery store or farmer's market, I hope you'll give these bags a try. Be creative and enjoy! Note: The bag I made weighs about 1/4 of an ounce. Maybe not as light as plastic, but I'm willing to pay the extra cent (give or take) that it will cost me to use it. I'm thinking it would be a great bag for the collection of seashells I find on the Florida beaches! It would be easy to rinse out also. Good idea. Great post! I am wondering if you could tell me if you have and how to dye the mesh used in this article...I am using for mushroom hunting and it cant bleed easily if it gets wet. Thanks for reading, Snow White. 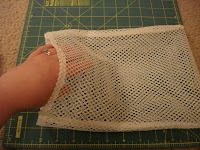 The mesh I used for this project was polyester. I don't have a lot of experience dyeing synthetic fabrics. I would definitely look for a dye specifically made for synthetics. 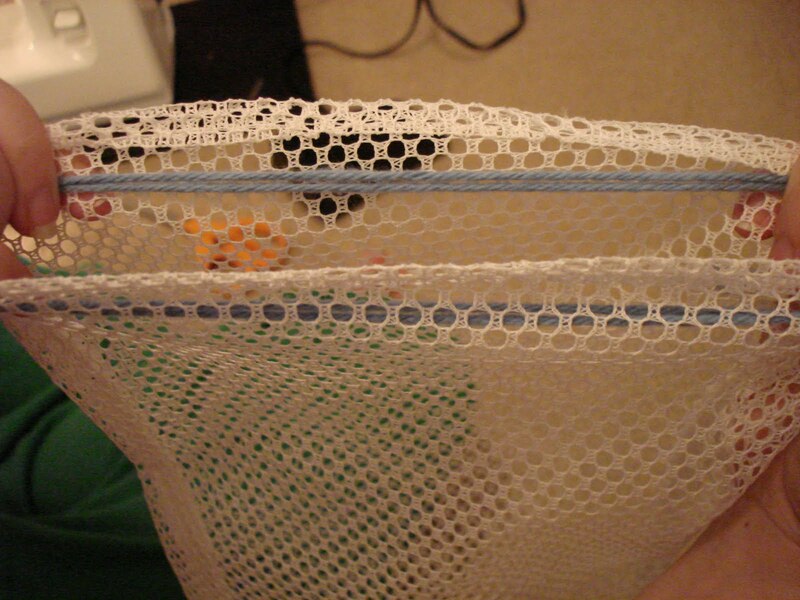 If you are able to find a cotton mesh, it would be easier for you to use a boxed dye (like Rit). I'm also very excited for mushroom hunting this year. Best of luck!